One of the first things I did a month ago when we first purchased this property was to reach out to the Stafford County Historical Society for any information they might have. We were surprised to find out that the early history of Boscobel Farm dates back to 1658, roughly 118 years before America won it's independence in 1776. The historical society says that it is unknown how far back the structure of Boscobel (pictured) dates back but it is thought to be 1752. Several items we have seen mention 1702, such as the colorized image below. We are adapting 1702 since it falls nearly in the middle of 1658 and 1752. A colorized version of Boscobel in the early 1900's after the structural changes and addition of the Victorian front porch by the Hurkamps. The Pin Oak pictured at left sits just outside our sunroom. Thank you for contacting the Stafford County Historical Society. As you no doubt know, this farm belonged to the Fitzhugh family for several generations. The exact date of the original structure isn't known with certainty, but is thought to have been c.1752. It was a 1 1/2-story frame structure with five dormers across the front and a chimney on each end. It was typical in design for the period, but was larger than most dwellings in this area. A late nineteenth or early twentieth century photograph shows a porch across the front and along one end. That may or may not have been original to the structure. 1658--part of a 6,000-acre patent to Thomas Wilkinson. --William Fitzhugh (1651-1701)--at some point acquired all or most of the Wilkinson patent. 1823--Charles E. S. Fitzhugh (died 1841)--brother of John R. Fitzhugh--1823 they traded bequests. Charles died intestate and farm sold to Sarah S., Catherine R., and Henrietta Fitzhugh. 1866--William H. Fitzhugh, Jr. and his partner and brother-in-law, William A. Little, divided Boscobel. Little received the old house and 400 acres. 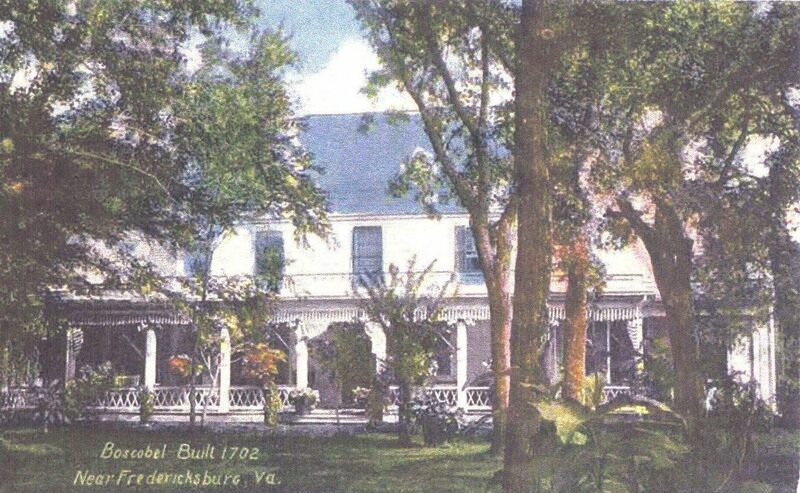 Fitzhugh took the other 365 acres with a new house called New Boscobel. 1898--William A. Little, Jr.--father gave him the property in consideration of his forthcoming marriage. Little, Jr. already owned a nearby 105 acres tract he called Moreland and he joined the two into a 520-acre tract. 1900--W. A. Little, Jr. conveyed Boscobel and all his personal estate to his wife, Jessie Sharpe Little "for her sole and separate use." WAL was an alcoholic and lost his license to practice law in Stafford. Jessie divorced him and he died in Washington, DC. It seems to have been the Hurkamps who so drastically changed the original Fitzhugh home. They raised the roof, making the half-story a full second story. They Victorianized the porch adding large columns and a fancy railing. This building burned in 1915. Do you have any interesting information about Boscobel or the Fitzhugh's? Do you own a historic property? We would love to hear from you! Comment below.